Dining etiquette is one of the many important things many are ignorant of or choose to neglect. To those that are ignorant about it, it is okay. I am here to educate you as I also educate myself on the basic dining etiquette. To those that choose to neglect it, it's never too late to learn. Dining etiquettes are many, but we will just be mastering and understanding the basics. Why do one need to really master and understand dining etiquettes? 1) We live in a civilised world. 2) We, as humans eat. And since we humans naturally consume food, it is necessary/important to master and understand the basic dining etiquettes. Many might say, ''well, I don't really eat out so what's the need to master this etiquette of a thing?''. Well... remember that it is being said that ''ignorance is not an excuse''. Besides, these basic etiquettes are easy to master and understand. Aside from that, you will one day be invited for a dinner date/event, a business lunch or a first date, will it not be nice if you learn or already know the basic dining etiquettes so that you don't go embarrassing yourself? Like it was said on ''What To Do Before, During And After A First Date For Women'' >>> chidinmainspirations.blogspot.com/2014/07/what-to-do-before-during-and-after.html?spref=tw … and ''What To Do Before, During And After A First Date For Men'' >>>http://chidinmainspirations.blogspot.com/2014/07/what-to-do-before-during-and-after_29.html?spref=tw … mastering the use of cutleries is very important. To those organising an event, a napkin should be placed in the middle of the plate. P.S- You can choose to place the napkin in any way you choose to place (in terms of design) it in the middle of the plate. It is not compulsory you follow the design in the picture below. Napkins should be placed on your laps before you start eating and not on your neck. The below pictures do show how to do so. I don't know if a lady should cross her legs when eating. However, I believe that as long as she is comfortable, that is alright. P.S- Please do comment below if your views conflict with mine on how a lady/woman should sit when she's eating. When you are not yet done with your food but need to be excused, maybe as a result of you wanting to use the restroom or you want to get something, do place your napkin on your seat. This indicates that you will be right back. 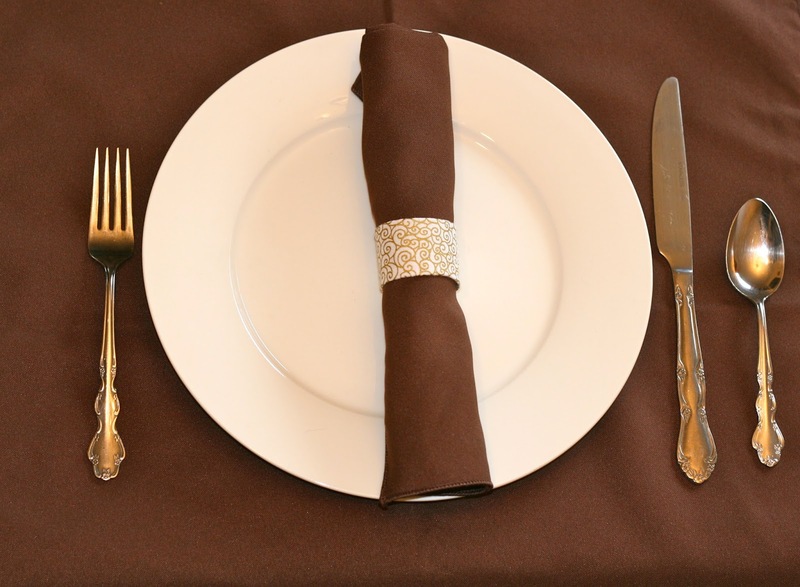 A napkin should be placed beside your plate after you are done with your meal. This will inform others you are dining with or the waitress that you are done eating. The normal cutleries basically used for eating in a formal gathering is a fork and a knife. 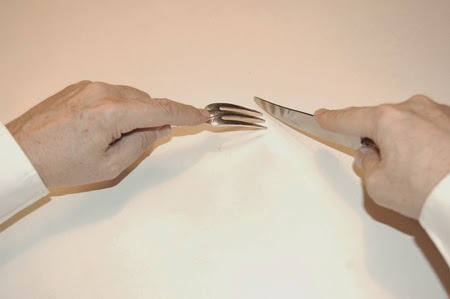 A knife should be held with your right hand while a fork should be held with your left hand. Pictured below is how to hold a fork and knife. See the way he is holding his knife and fork. Also see where is fingers are placed on the knife and fork. 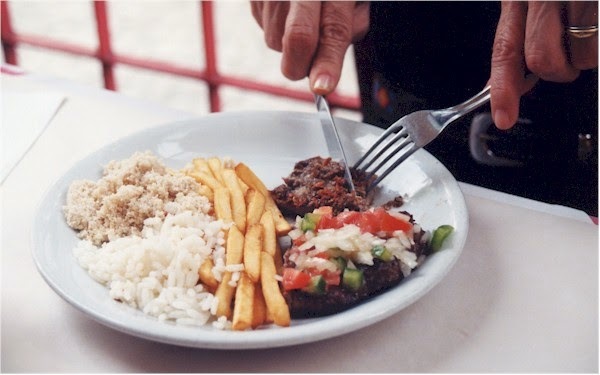 See how the fork and knife is held on the plate. Let's assume there is food in the plate. The logic is, hold your food down with your fork (remember, your fork should be held with your left hand), then cut your food with your knife, which you are holding with your right hand. The illustration of the picture above is what the man in the picture below is doing, but this time around, there is food in his plate. Your fork should be placed across your knife while your knife should be facing down when you are resting from eating. That is, you are not done with your food and will continue shortly. When you are done with your food, your knife and fork should both be facing down inside your plate. 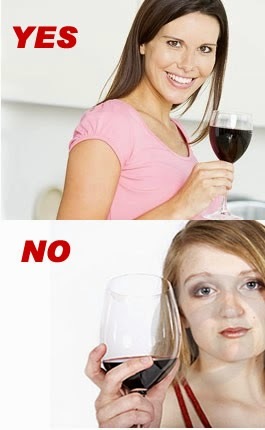 As can be seen in the picture below, you should hold your wine glass on the straight glass supporting the cup and not on the body of the glass cup. 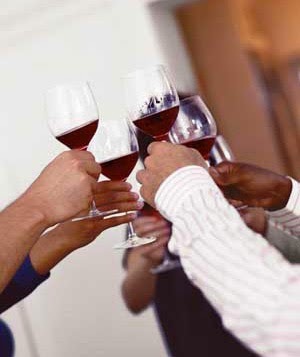 Can you see how the people below are holding their wine glasses? That is how a wine glass should be held. When you are done eating, you should clean your mouth like the man in the picture below. P.S- I'm not saying that you should smile when cleaning your mouth. LOL (Laugh Out Loud). You can smile if you want to, but it is not compulsory. Clean your mouth after eating like the man pictured above and not like the man pictured below. 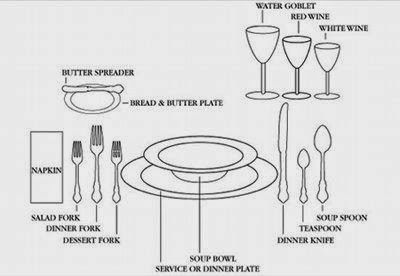 P.S- The below picture shows the kinds of glasses, spoons, forks and plates that are normally placed on a table should in case you find yourself in an event/occasion with more than one fork, knife etc. I hope you have been inspired, I sure have. Please be kind enough to share with others to inspire them as well. We love hearing from you, so do feel free to share your thoughts, suggestions or contributions by commenting below. Thank you dear. It's always important to educate oneself on these things cos we just never know when we might need them. This is really educating dear. As regards the napkin, thanks for the clarification. I put mine on my laps though but I still see people put on their neck. I still saw a guy today at the office dining on a really nice pair of suit and he put serviette on his neck...hian! I was like wataguan. I have been on a date with guy before and his dining etiquette was a total write off..i was kinda embarrassed. that was d last time I ever hung with him.